On April 15, 2015, Robert Rue died on the job. Rue had been an electrician since graduating from Cary High School in 1971 – coincidentally, the same year the Occupational Safety and Health Administration was formed. Rue was repairing exterior lights outside the Archives building in Raleigh when the lift he was in toppled over. Aged 62, Rue was just over 3 months from retiring to the Outer Banks with his wife, Marlene. They’d planned on moving into a house they built in Belhaven. Now Rue’s widow will be living there without him. In 2015, the most recent year for which the full count is known, 150 people working for a better life in North Carolina never made it home to their families. Some workplace fatality victims were young, like Mason Cox, 19, of Gastonia, who died his first day on the job, while many others like Rue died on the verge of retiring, denied the chance to enjoy the fruits of a lifetime of labor. Safe jobs are the right of every worker, and no one should fear going to work. 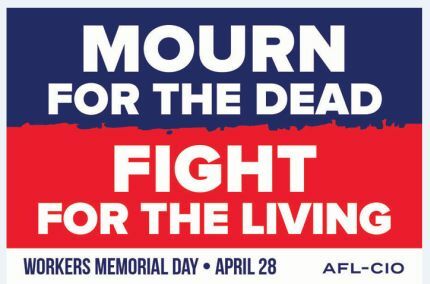 That’s why every April 28th since 1970, when Congress passed the Occupational Safety and Health Act (OSHA), the labor movement has observed Workers’ Memorial Day. OSHA passed with the recognition that: a) basic working conditions must be safe, b) companies have a responsibility to do everything they can to provide a safe working environment, and c) regulators have a duty to investigate and act to protect the working public when companies fail to do so. Everyone should be equally protected by elected officials whose job it is to improve workplace safety, but as the News & Observer’s series “The Reluctant Regulator” revealed, North Carolina Commissioner of Labor Cherie Berry is more interested in protecting businesses. Penalties aren’t the solution to everything, but when workers are dying, politicians shouldn’t fear using them – especially when employers don’t seem to be getting the message. In July 2015, Dennis Laney, 65, died on the job at a construction site in Winston-Salem. The company he worked for had previously been penalized for safety violations, but obviously those penalties didn’t serve as an adequate deterrent. The sad fact is that some North Carolina employers count on the lax enforcement of safety rules to pad profit margins by risking people’s lives, but enforcement of those rules and penalizing those who flout them is a core mission of the Department of Labor. If the commissioner’s staff lack the tools and resources to carry out that mission, Ms. Berry ought to lobby the legislature for whatever she needs to get the job done. Under Commissioner Berry, the North Carolina Department of Labor has never held an official Workers’ Memorial Day commemoration, and Ms. Berry has never attended any of the community-organized observances held near her office in Raleigh to acknowledge the tragedy of workplace fatalities. That’s a shame because the public deserves to know that their elected Labor Commissioner not only mourns those who have died on the job but what she will do to fight for the living. William Dworkin is the President of the NC Alliance for Retired Americans Education Fund.